Real, significant $ transactions that transcend supposed "value" for the card / player. My proposal would be.... wait for it.... the 1913-14 Taddy & Co. Billy Meredith card. So why do I consider the Billy Meredith 1913-14 issue to the be most desired card in the set and probably most valuable pre-WWII soccer card? 1. The London Mixture cards are something of lore. We are still cataloging the Manchester United cards from the set (and many other sub sets). Most cards in the set have only a few known copies (whereas the 1907 and 1908 versions are much more available). 4. While I have not been able to find the auction, I have heard that the card sold for roughly $16,000 in or around 2010 - huge money for any soccer card (until the recent rise in Pele rookies). From all of the amazing pre-war cards, this card seems to fit the bill from my perspective, though I am willing to change my mind in case someone has a different proposal. I have attached pictures of the catalogs to see the progression. IMO, there is only one T206 Wagner. No other sport has a super short printed superstar card in one of it’s top 3 sets. I’d never really heard of the 1913 Taddy set until you mentioned it and if there are only a few copies of each card, I don’t see how it can be highly collected. How many people are attempting that set? I’ll take your word for it if this is the most valuable Pre-War card, but I don’t think there is any Wagner of soccer. And that’s perfectly fine. Boxing has the Leaf Graz (and Red Sun Jackson by my opinion)... I am speaking on a relative basis for the support... of course, nothing will compare to the Wagner but the question is what is the closest thing in soccer / football card collecting. I admit that my knowledge of soccer cards pales in comparison to some of the posters on here, but I love learning about the iconic cards from other sports. I think the Billy Meredith card is way too obscure to be the "Wagner of soccer cards." The T206 Wagner has been famous for 100 years; the Meredith card has only been known for 15 years. if we are going to force any soccer card into being the equivalent of the T206 Wagner, I think it is the Quigol Pele. Last edited by Bored5000; 08-03-2018 at 11:52 AM. I admit that my knowledge of soccer cards pales in comparison to some of the posters on here, but I love learning about the iconic cards from other sports. I think the Billy Meredith is way too obscure to the "Wagner of soccer cards." The T206 Wagner has been famous for 100 years; the Meredith card has only been known for 15 years. I can pretty much guarantee that most Brits would not know who Honus Wagner is, so I am not surprised that Billy Meredith seems obscure to US collectors. However, I am pretty sure that most Brits would have heard of Babe Ruth. I could be wrong, but I think that this is reasonable given the amount of cards issued overseas that include him (pretty much like Pele - the global super star with cards of him issued all over the world). Therefore, in defining my "Wagner" I was looking for a valuable card of an amazing player / HOFer from a highly collected prewar set that was not just the rookie card of the sports best player - that is easy. I was also trying to stay away from post war cards in the spirit of the Wagner (which would include all Pele cards). BTW, Billy Meredith had a 20+ year career and have many cards issued of him and he (and Steve Bloomer) are probably the top two early British Football stars. Of course there is no true Wagner of soccer cards... was just hoping to have fun with some entrants and see what others thought. This was just meant to be a fun conversation and I was hoping to get some other "entrants" to the game from other posters to see what other cards are out there. Last edited by aljurgela; 08-03-2018 at 11:39 AM. 1. Early superstar of the sport. I think Honus Wagner would be known to baseball fans even if he didn't have his famous T206 card. The same isn't true for Meredith. I would say that 99.99 percent of soccer fans don't even know who he was. I didn't learn who he was until I got deep into soccer card collecting. First you wrote "highly collected set," and then you proceeded by saying "for those of you who don't know this set." Funny. If this is a highly collected set, then you shouldn't have to explain it to us. Oh, and I have never heard of this Taddy set either. And finally, it looks to me as if you selected Meredith because he played in the same era as Wagner, but it doesn't have to be this way. This is the first card of the king. 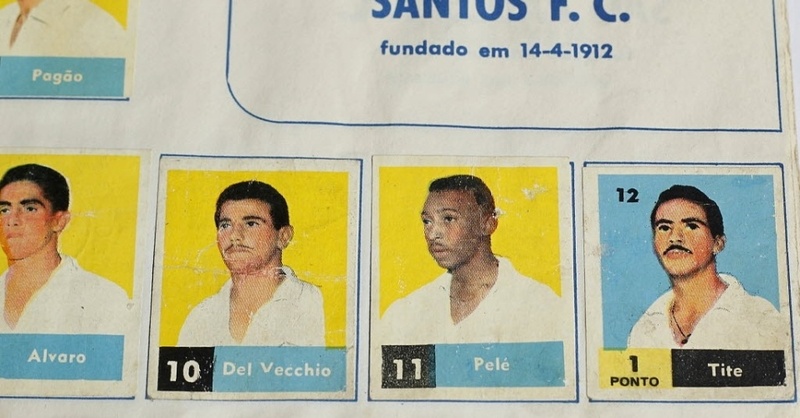 I am not sure how many examples exist, but it's extremely difficult to locate (so don't even try searching for it on eBay ) The above picture was taken from an album owned by the biggest soccer card collector in Brazil, Moacir Peres, a retired judge. I would give up my whole entire soccer collection for this one card. ^Well, that’s an interesting item but from another set I’ve never heard of. I think it makes most sense to establish what the most collected sets are and then see if there are any short print superstars. Fair enough. Try asking a non collecting baseball fan who Honus Wagner was and see what you get. Most of my non collecting friends have no idea. And those that do see to think he played for the Dodgers or the Yankees! Highly collected in UK, not USA. Pretty sure that if you said T206 to a Brit, they would have no idea what you are talking about. Just a guess. That Balas Futebol Pele is my "holy grail" Pele card, no doubt. His copy is the only one that I have ever seen or heard of. He has been on many TV shows and magazines and I have never seen anyone else. If we are going to push this into post war, I like the choice of the Quigol Garrincha as a SSP! When I refer to highly collectible, I was mainly referring to the UK card seen, not the North American card seen. I don't think that ANY soccer cards are highly collected in the USA. In the UK, however I understand that Taddy & Co have quite the following. Similary to the Pinnace sets. Any time you find websites dedicated to a particular set tends to say something. So what are some of those in your eyes? I noticed that some of the Greiling cards from the 1920's have some players who are extremely difficult to find. Do you know of any SP's out there of superstars in either pre or post war? Very few people on this side of the pond would have heard of Honus Wagner. As for Babe Ruth? Most people into sports would have some knowledge of him but the most “famous” baseball player over here (insofar as the player most people, including those not interested in sporting history, could likely name) would be Joe DiMaggio. This is because of his relationship with Marilyn Monroe and, more so, the reference to him in the Simon & Garfunkel song. Billy Meredith was, without doubt, an iconic player in the earlier years of the sport - although he probably played a bit too early for his name to be recognisable today. Anyone with an interest in British football history will, without doubt, know of him but, for those with a more general liking for the game, the pre-World War Two player they would likely be able to name is Dixie Dean and, without doubt, Stanley Matthews (although much of his career was post war). I don’t know the card market but anything Meredith-related will command a premium given his Manchester United connection. Manchester United are, by some distance, the most collected British club and the prices achieved for rarer Manchester United items are vastly higher than those for any other team. This is a great discussion, so don't take my opinion as criticism. I enjoy the discussion. I think the Balas Futebol Pele card and the Taddy and Co. Billy Meredith card are just too rare to qualify as the Wagner of soccer cards. The Wagner T206 isn't at all rare relative to many pre-war baseball cards. Honus Wagner himself has several cards that are far, far more elusive than the T206. Much of the mystique of the Wagner T206 is because it at least circulates once in a while. That is why I would go with the Quigol Pele. The card at least has to sell/go to auction once or twice a year or so IMO to be a Wagner equivalent. Look at some of the other cards that are often considered Wagner T206 equivalents -- the 1935 National Chicle Bronko Nagurski for American football, the 1948 Bowman George Mikan for basketball, the C55 Georges Vezina for hockey. All those cards are from mainstream sets, yet none of those cards are impossible rarities. Last edited by Bored5000; 08-05-2018 at 06:23 AM. Yeah... those are all good choices for the other sports... I would add the Rocky G Leaf for boxing as well. It is hard to say that any high dollar soccer cards have been auctioned until very recently. In my opinion, not knowing much about this, any topic in a soccer card discussion has to begin with Pele. So if he has a rare, expensive, but not impossible rookie -- that's a good enough analogue to the Wagner for me. Last edited by Peter_Spaeth; 08-05-2018 at 12:55 PM. The Quigol Pele card being mentioned in this thread is the card Anish (page one of this thread) uses for his avatar. Heritage just sold a PSA 8 of the card for $33,600 last month. There’s a difference between an auction house calling a card a Wagner equivalent in order to promote it and the card actually being comparable based on the criteria established by Al. The Mikan, Nagurski, and Vezina all feature inaugural HOF inductees from top sets. However, none is a SSP. The Mikan and Nagurski are high number cards and accordingly relative short prints, but still readily available; I’ve owned all three of these cards but will never own a Wagner. It’s not rare for a Pre-War card but it’s incredibly rare relative to the rest of the non-SP’s in the set. Graziano, from what I’ve just read, fits the criteria. I can’t think of any soccer card that does. The most popular sets from what I’ve seen are probably the Wills and Ogden’s tobacco cards, the AB&C Gum cards, and the Panini World Cup stickers...but I don’t even really know. Part of my goal in asking what everyone was collecting was to see which sets people are collecting. But this is just a small group of English speakers on a vintage baseball forum haha. The Pele Quigol or other card might be the “Ruth RC” of soccer...but the Wagner is not even close to being a RC. That’s not what makes it *the* card. Anyway, any discussion of vintage cards is a fun one in my opinion and I certainly don’t mean to shoot down other ideas while offering my own. I just don’t see a Wagner equivalent anywhere apart from boxing. That's a pretty good return for the guy who likely paid a fraction of that. World Cup bounce or market shift, I guess we'll see. I agree this is a very interesting discussion. The Nagurski, Vezina, and Mikan cards are almost universally on a "Mt. Rushmore" of cards for that particular sport. I think the fact that you have owned all three of them, but will never be able to afford a Wagner T206 is because baseball far and away trumps everything else when it comes to prices. There are numerous $10,000+ baseball cards of players that the general public has never even heard of. Not that Joe Orlando is the be all and end all when it comes to cards, but IIRC those cards were the highest ranked cards in their particular sport when he did his top 200 sports cards book. There is no "correct" criteria for what make a card a Wagner equivalent in other sports. But to me, I think the card has to trade hands at least once or twice a year. That is why I would go with the Nagurski card over the Anonymous (John Dunlop) Mayo card for American football. The Just So Cy Young card would, no, doubt, fetch an eye-popping price if it were to go to auction. But it is just not common enough to be compared to the mystique of the Wagner. Being easily available has not hurt the desirability (and mystique) of the '52 Topps Mantle at all. The Graziano card is an interesting case; it is far away the most valuable boxing card in the hobby, but Graziano (while a world champion) is not on anyone's list of top 10 or top 20 all-time boxers. Same thing for the McKinley card from the 1932 U.S. Caramel set. Hockey and baseball also have some extreme short prints that sell for five or even six figures based solely the issuing company not printing many examples so a prize could not be redeemed. Last edited by Bored5000; 08-08-2018 at 10:43 AM. And the fact that nobody can propose any prewar alternatives probably makes the whole topic clear.... outside of Pele rookies, there are no other real potential Wagner cards. Would anybody like to see some of my other entrants to the conversation? The Graziano card is interesting case; it is far away the most valuable boxing card in the hobby, but Graziano (while a world champion) is not on anyone's list of top 10 or top 20 all-time boxers. Same thing for the McKinley card from the 1932 U.S. Caramel set. Hockey and baseball also have some extreme short prints that sell for five or even six figures based solely the issuing company not printing many examples so a prize could not be redeemed. Sure, but the cost is a function of it being a short print - not simply because it’s a baseball card. If it were printed in the same quantity as the Cobb, the Cobb would likely sell for more and the Wagner would be as attainable as any of the other cards mentioned. You can’t describe the importance of the Wagner without explaining that it is extremely short printed relative to the rest of the set and that the reason may have something to do with Wagner himself. That’s not the case with Mikan, Nagurski, and Vezina. Those are more like the T206 Cobb’s or Sporting News Ruths of their sports. I love my Pele Quigols and my C55 Vezina, but I couldn’t with a straight face hold up either and say it’s the T206 Wagner of anything. Actually, the 1960 Hemmets Cassius Clay in PSA 10 beat it by a wide margin. But to extend the analogy, I would consider the Clay the 1952 Mantle of boxing and the Graziano the T206 Wagner of boxing. As for soccer cards, I am enjoying the discussion but haven't the expertise to chime in other than to say that an iconic card needs a combination of great subject, interesting back story, and sufficient availability so that enough people can own one. Otherwise, it becomes an obscure rarity. I have dozens of extremely rare cards with far fewer examples than the T206 Wagner. I would trade them all for it. You're right. I forgot about that. I understand what you are saying. But there are 60-70 Wagners in existence. It's $400,000 just to own a beat-up, folded and mangled example. There is no other sport with a $400,000 beater that is so plentiful. There are more Vezina, Nagurski and Mikan cards in existence, but those are also a few thousand dollars to own an example instead of $400,000. There are lots and lots 52T Mantles in existence and that is an $8,000-9,000 card just to own a beater example, because it's baseball. Last edited by Bored5000; 08-08-2018 at 03:26 PM. Nearly my entire collection is obscure rarities worth only a couple hundred dollars each. The Amelia Earhart card I am using for my avatar right now is a legendary rarity from the 1938 Heinz Aviators set. I could not believe when it showed up on eBay with a reasonable BIN. Last edited by Bored5000; 08-08-2018 at 03:08 PM. Ok, Since most did not like my Billy Meredith 1013-14 Taddy & Co. pick, my next proposal would be the Ferenc Puskas 1947 Nannina. So let's start with the player. For those that do not know Ferenc Puskas was a legendary Hungarian icon. He averaged nearly a goal per game at nearly every stop in his career - club or country. He is probably best known for his time at Real Madrid playing alongside Alfredo Di Stefano where they won many title (3 European Cups, 5 Spanish division)... and this is all in the back half of his career (after he was 30). Prior to his defection, he led Hungary to the gold medal in 1952 and the World Cup final in 1954 (where they lost 1-0 to Germany). In the end, he is rated as the #6 all time player by IFFHS, #7 by World Soccer, #7 by Top End Soccer and #17 by the FIFA internet poll. He was also given the IFFHS award for the Top Scorer of the 20th century and the annual FIFA Award for the most beautiful goal is called the FIFA Puskas Award. Bottom line, this guy was legit. So now onto the card. His rookie cards (as far as I can tell) hails from a 1946-47 Nannina issue from Italy. It includes many national teams and is made to be hand cut (think dotted lines like the Post cards from the 1970s). That is a total of 7 graded copies. It has also come to my attention that PSA is no longer taking submissions of this card, though I do not know why. To follow up with a few of the points raised by others. This card does trade every now and then. The last time that it traded was on eBay about 6 months ago. A hacked copy brought more than $2k, which was quite surprising to me (I was not the bidder or the under bidder). Therefore, I can only believe that there are some people out there than feel that this is an iconic card. I surely do. With that, I hereby open the flood gates to other comments and points of view! but wouldn't you say that this was completely unexpected? Also wouldn't you agree that a Clay in similar grade to a Rocky G would not even come close... Rocky would take him down no problem in a similar grade? The Jose Nasazzi rookie card? First off, this is as good a place and any to talk about how generally in soccer collecting - like many other sports (most prominently American Football and Basketball) - defenders do not get much respect. OK, they can get some respect - think Ozzie Smith in baseball or Rodman in basketball or Gary Payton or the hottest corner of the day in the NFL - but not much as a group. Soccer is much the same way. You need to be AMAZING to get any notoriety at all. Collectors and historian tend to focus on goal scorer's not goal "preventors" - save for the occasional great goalie like Lev Yashin or Beara. While this write up is pretty poor, you can learn more about him here. Al, as someone who is an outsider here, it seems to me that except perhaps among very hard-core collectors/fans there isn't much interest in soccer cards or the history of the sport itself pre-Pele. That seems to differentiate soccer from baseball where (except perhaps with the very latest generation) everyone is somewhat familiar with the greats of the game from the turn of the century on. Maybe I'm just projecting my own outlook, but I have talked to several guys who buy some soccer cards and they pretty much feel the same way. So I am not sure a pre-war soccer card is really a meaningful equivalent to the Wagner. Just my .02 which I would discount at least to .01. There is significant interest in the history of soccer and certainly pre-Pele. There are countless high quality soccer museums, albeit they tend to be club or national specific. However, it is true that most of the icons of the game are from post-World War Two onwards and, other than historians, few could name any pre-World War One Stars with soccer history typically being well documented from the 1920s or so. Culturally, it is a very different sport to baseball. There is much less interest in game statistics (a good thing IMO, although statistical overload has crept in over the past two decades) and very few traditional soccer fans could ever, nor would want to, understand the US “franchise” model. The migration of the Dodgers and Giants from NYC to the west coast simply could not happen in soccer - if, for example, an owner tried to relocate Manchester United to London or Internazionale from Milan to Rome, there’d be civil unrest to an extent that the league would become unmanageable. However, from a collecting perspective, I believe the key difference is that cards are much less intrinsic to soccer culture than in baseball. For example, Gallaher was a large tobacco company formed in the north of Ireland (what would later become Northern Ireland). Certainly in the 1910s and 1920s, they were prolific issuers of cards of Irish (and English / Scottish) soccer players - they would presumably have been obtained by grandparents and great-grandparents of many soccer fans here in Northern Ireland but, although I know many collectors of soccer memorabilia here, few are interested in cards nor do I know of any who have an emotional attachment to cards based on their prior family generations having built up collections - albeit many were clearly retained as they are easy to purchase today in good condition. Yeah, footballers are evaluated based on technique, skill, touch, speed, vision, etc rather than OBP, WAR, Home Runs, etc. Accordingly, it’s hard to properly appreciate players who don’t have footage on YouTube. The game was also so decentralized before the World Cup and European Championship eras, so who knows how good Dixie Dean was relative to Paulino Alcantara. I’m not sure if cards (well, stickers) are less intertwined with soccer than baseball. Maybe it depends on the region. I know match programs were big in the UK but I think stickers predominated in South America. The Puskas and Nasazzi are both awesome cards. Always great to see any important Pre-War issues. I don't think this card is the T206 Wagner of soccer. I actually think Nasazzi is the caliber of player that could have a card with this honor, but I can't think of a card of his that would fit the bill. For a card to be the T206 Wagner of soccer, it has to be well known by everyone and on everyone's want list. I can't think of any vintage soccer cards (anything pre-1950) that are well enough known by all soccer collectors to make the list. There are some cool rookies out there of star players that are a bit more known, but none that is that well known. I think the argument for a Pele rookie to be the Wagner of soccer has merits, but I can see that it is more of the 52 Topps Mantle of soccer argument as well, since it's in the same era. I think a card could bubble up someday that becomes the Wagner of soccer for vintage, where it gets discussed and publicized in media and then over time gets added to all collector's lists. But I think that the vintage soccer hobby is still in its infancy and it might be decades before a card takes that honor. By the way Al, is there only one 1913 - 14 Taddy Meredith? Are cards (well, stickers) less intertwined with soccer than baseball? I originally started collecting soccer purely for speculation / investment. Part of my logic on this is that in the US, I think baseball cards will become less popular/expensive after my generation (those that grew up in the 80s / early 90s) starts to die off because baseball cards won't have been an active part of a kid's childhood. I grew up in a time where we all took our binders of cards to school and traded at recess. I think that soccer will increase in value because every 4 years kids around the entire world collect soccer stickers right now. These kids will all grow up into adults and will someday gain a disposable income (especially as the world economy becomes intertwined and lifts incomes in poorer countries). And these kids will want to buy into the nostalgia, just like I do. So I see that cards (stickers actually) are completely intertwined with soccer and will become more and more recognized as such in the generations to come. It does seem that this is less the case in England. And it is also not the case in the US. But in Italy and South America, parts of Asia and Eastern Europe, I think this is definitely the case. Which vintage soccer sets are most widely collected? The T206 Wagner and 1952 Mantle aren't the rarest cards by any means, but the sets have a huge collector base, which attributes greatly to demand and value. My knowledge of soccer sets is limited, but I would be inclined to choose a card from a one of the more well-known companies - Panini, SADA, Lampo, Mira, etc. Cards/stickers from album sets can be especially condition sensitive, and in some cases near impossible to find in rare form. Many sets have scarce variations such as Panini's Valida backs which might be canidates for a holy-grail card consideration. I have a few of those "Wagners" that you could have for less than 2% of his asking price! I agree here completely... Looking for something outside of the "easy answer"
I am a member and season ticket holder of Internazionale in Italy so I can say with some authority that cards / stickers are not the primary soccer collectable there. The money goes to shirts, especially vintage shirts, and pennants. Walk into any of the large soccer museums in Milan (for example, the San Siro Museum) and you won't see anyone fawning over a card - rather it will be old shirts, photos, medals and trophies. Have a look at soccer auction results and cards don't get the largest prices. Baseball is drowning in stats, but they do facilitate discussions of comparing players across different eras, which people always love. I think it's relatively harder to do that in a sport far less given to stats, and it could be (just theorizing) that the lack of stats is one reason casual fans may be less interested in greats of the distant past? I love stats...but it’s hard to capture much beyond goals and assists in soccer and even then numbers are not always meaningful or comparable. Hockey has goal and assist numbers Pre-War (though assists were given out much less frequently) but Pre-War players are still dramatically underrated. A typical baseball top ten will be filled at least half with Pre-War players while a typical hockey one will not have any. I think baseball overrates Pre-War players since they played pre-integration (meaning that the “replacement level player” was much worse than today) but that hockey and perhaps soccer underrate them. Last edited by Anish; 08-15-2018 at 08:56 AM. That's the thing, a midfielder can control a soccer game ( well, as much as any one player can) but not show up in the counting stats at all. At the other extreme, almost everything that happens in a baseball game can be measured and quantified. Last edited by Peter_Spaeth; 08-15-2018 at 09:05 AM. I think that is right, Peter... and I think the international aspect makes it even more difficult. There are so many leagues, so many players and historically not much play between them except the World Cup and the Olympics in the pre-war discussion... not many TV clips or game footage. So between stats, language and inability to compare it because harder to do that and there are no guides (that I know of) that consolidate the information. Many top soccer historians go a great job, but all the work is piece-mail. I am planning to consolidate some of this information in a book that I think will be helpful for collectors and I will base my information off of other people's historical efforts. In other words, I will try and show some collecting options of the players that most historians think were exceptional in their times which for me should always be the standard. Unfortunately they are even highly focused on post war players. If you look at all the people on this (somewhat political - note the inclusion of players from China and Kuwait) list only Stanley Matthews played many of his great years prior to WWII - so it is basically a post war list. This is phase one of their work and I am not sure how many phases there are. You can click on players and there are (albeit too brief) descriptions of the players and many have YouTube videos with clips of some of their antics. Check out the one on Zico and him amazing free kicks from outside of the box. Anyway, it all starts with interest and education and I believe that, in time, these things will come to US collectors. Also when the World Cup in here in the USA, I imagine that there will be much more interest as well. You may be right that the most collected items currently are shirts and pennants, especially by adults. However, the reason I collect cards is because as a child it let me get close to my baseball heroes. I love baseball and was never very good, and loved to pull out my cards so that I could feel close to the game. Also, cards make a good collectible because of their size. I really am interested in knowing if kids in your neighborhood or who you meet at the soccer stadium collect stickers now. OK guys, some of you may have seen my posting on Leonidas Da Silva, but probably my favorite card of his (and one of my favorite soccer cards in general), if the 1950 Tinghalls Leonidas. This card (and all of the Sao Paulo issues) of Tinghalls are exceedingly rare and I know of just three copies of this card. It appears that they were made to celebrate a tour of the Sao Paulo team in Sweden. The last time that I saw this card at auction was about 5 years ago or so and it brought $800. I did not win that card and had to pay much more than that to get this copy. Anyway, enjoy. I think video games (eg FIFA) have replaced cards. That being said, many people collect items from before their time (myself included) as opposed to items from their childhood.